I've been holding out on you -- I've been making these Blueberry Crumb Bars all summer, ever since our first blueberries ripened in late June. Every. Single. Week. Mr. Rosemary likes them that much. (So do I.) And I have enough in the freezer to make, oh, I'd say enough for a weekly batch through January! And when my eight year old cooking student took them to a friend's home for dinner he got a thank you note and a request for the recipe! 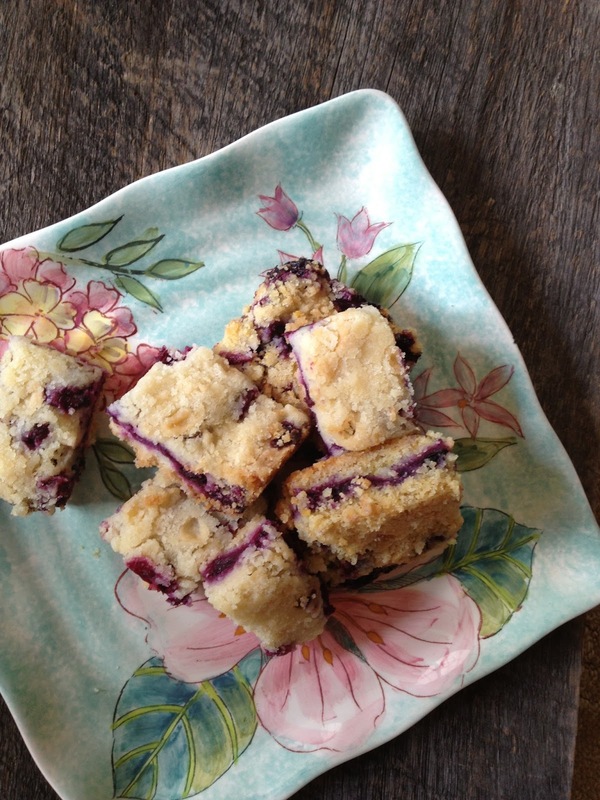 Maybe you'll become a blueberry crumb bar junkie, too, after you try these. They're pretty simple, oh-so-good, and can be a great dessert, a nice snack, or a complement to a breakfast spread. But Mr. Rosemary will suggest that you warm these up a little and add a dollop of Cool Whip. And I might add, Cool Whip might do in a pinch but real whipped cream is so much better! 1. Preheat the oven to 375 degrees F. Grease a 9×13 inch pan. 2. In a medium bowl, stir together 1 cup sugar, 3 cups flour, and baking powder. Mix in salt and lemon zest. Use a fork or pastry cutter to blend in the butter and egg. Dough will be crumbly. Pat half of dough into the prepared pan. 4. Bake in preheated oven for 45 minutes, or until top is slightly brown. (This took an extra 10 to 15 minutes in my oven.) Cool completely before cutting into squares. The picture really doesn't do them justice, Susan. They do taste wonderful! These look fabulous. We are big blueberry fans. Makes me miss our blueberry bush. I mildly complain sometimes about having too many blueberry bushes, but I guess there really isn't such a thing, Sam. I just love my blueberries! These are the perfect summer treat. So sad to see the blueberries go away. Glad I got a freezer full, Emily! These look wonderful Rosemary, I'm glad you let us in on your secret! I made it again this weekend; a secret no more, Chris. I bet the combo of peaches and blueberries would be great, too, Liz. Glad you visited! This recipe looks like one of those simple knockouts that everyone would love. I am a blueberry girl to the core, in fact I have a freezer full right now. I guess I know what I'm making first time I get the chance. They look so soft and moist ... I imagine they could be made with raspberries, blackberries, cranberries ... b!ut blueberries are def the best. Yum! Those are some beautiful looking blueberry bars, Rosemary. They look like they travel well, too...really important in the summertime. Crumb bars of any kind are one thing nobody ever tires of eating. Warm, yes. But how about some ice cream on top? Some good ol' vanilla ice cream! Yep! Yum. These look sensational, Rosemary and obviously going down a treat in the neighbourhood. What a boost for your student to be asked for the recipe! I am envious of your blueberry crop. Blueberries are a rare thing in Ireland and come in mean little punnets (you could almost count the berries at a glance) so this is a good way to s-t-r-e-t-c-h the fruit. Liking Barbara's suggestion of serving your bars with icecream. Most of my recipes for something "blueberry" -- like a saucy topping for cheesecake or muffins -- call for a mere cup of berries. This recipe sees a full 4 cups! A great way to "use up" my crop, Hester.